Need ideas to augment your modern family home? Well this next abode should provide plenty of food for thought with its elegant, geometric facade housing a host of stylish, modern finishes and furnishings. Located in Brazil, this home was born of the creative minds at Livia Martins Arquitetura E Interiores, who have managed to create an open and expansive property, suitable to house a budding family. From the outset this home cuts a fine figure, with the crisp lines of its facade extending down to the front garden and driveway. Once inside we're met with elegant, contemporary decoration, with a range of artistic flourishes included to add a sense of character. 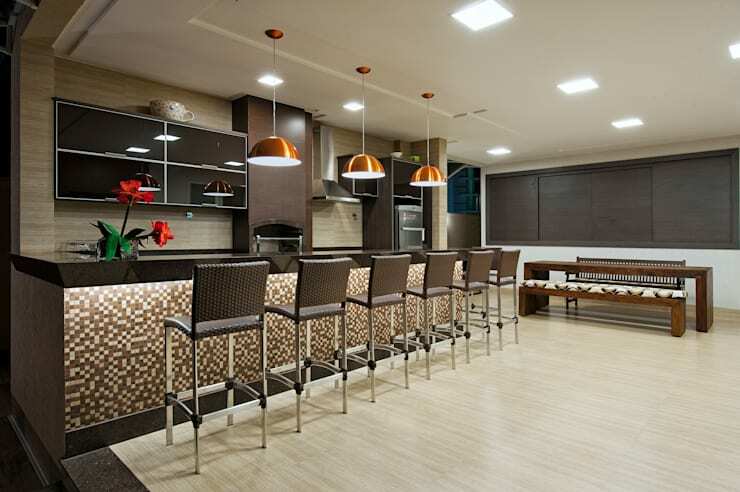 The home's kitchen is dressed in the unique decor of dark brown, with woodgrain and granite prevailing throughout the finishes and furnishings, while an area for casual entertaining has also been included—perfect to host a lively cocktail party! The bathroom emulates the crisp facade of the home's exterior, with its range of finishes creating an aesthetic contrast that frames numerous, luxurious bathroom fittings, and a glimpse at one of the home's bedrooms reveals a bold and striking design, bathed in a spectrum of blue. 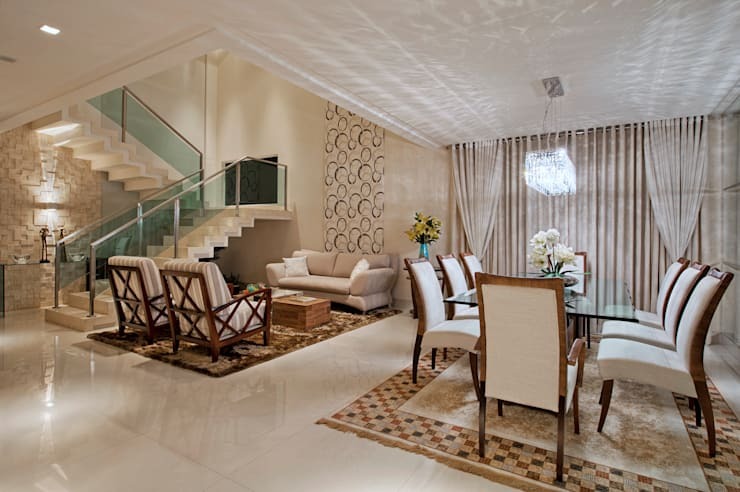 This home showcases a gorgeous design, with each room filled with its own, stylish personality. Take a tour below and tell us what you think! 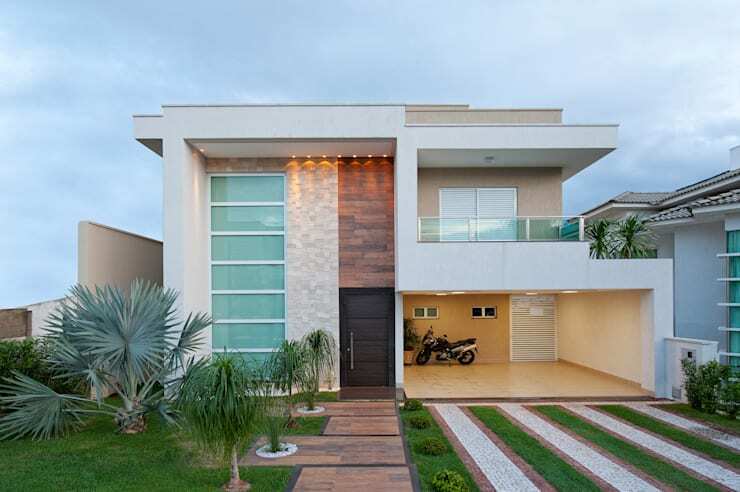 The exterior of this home emits plenty of modern style, with a geometric aesthetic evident not only in its facade, but also in its carefully manicured garden and driveway. The crisp lines of the home's facade have been constructed of a range of materials for a contrast of colour and texture, with concrete, wood and glass each featured. A stylish, paved driveway leads up to a spacious car port, while an array of wooden panels carve a structured path to the home's front door. Each carefully considered design element seen here combines to produce an air of elegant sophistication, intriguing onlookers and inspiring them to peer inside. Moving inside we're met with a stylish, artistic interior dressed in a muted palette, but including plenty to catch the eye. 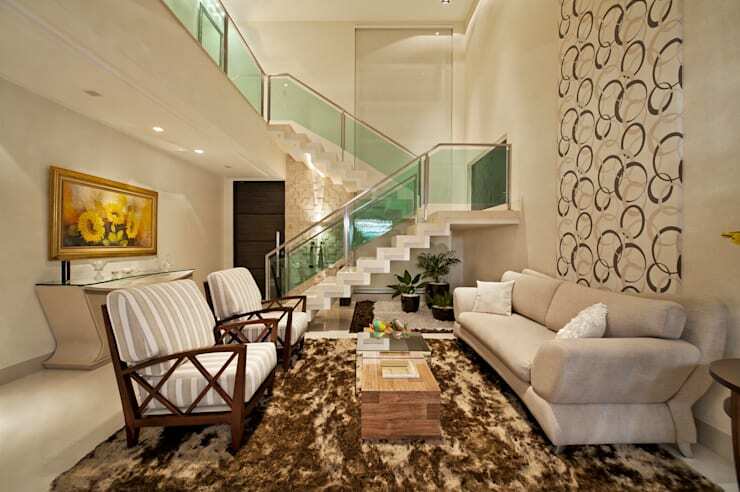 Contemporary lounges fill the space, resting atop a shaggy rug of light and dark brown. Modern art adorns the walls, from the sunflower painting on the left had side to the circular, graphic print flowing upward behind the sofa. In the distance a simple but stylish staircase provides access to the home's first floor, while beneath the stairs an array of pot plants comprise a small, indoor garden. Adjacent to the home's living room is this elegant dining setting, with contemporary chairs surrounding a sleek, glass table. A cubist, crystal chandelier hangs overhead for ambience, while large windows stand ready to invite sunlight into the space during the day. Combined, the living and dining rooms give off an air of casual elegance, with plenty of subtle character featured in the furnishings and artistic flourishes. 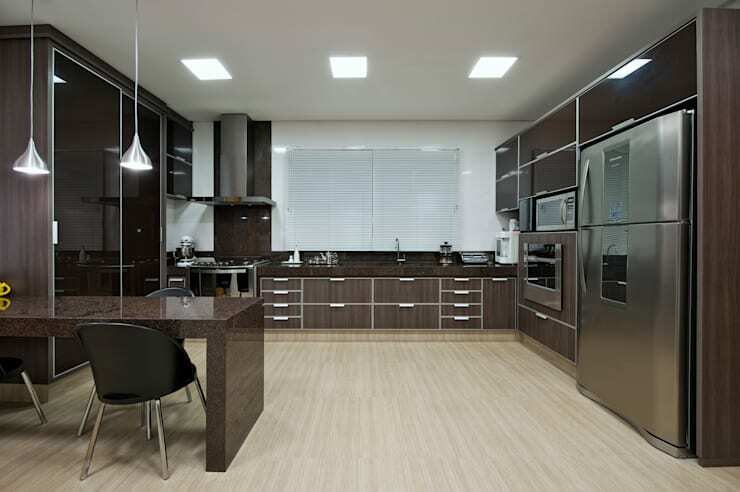 The home's kitchen departs from the muted tone seen in the living and dining rooms, with the space dressed in the deep, brown tones of woodgrain and granite. Stainless steel finishes, from the fridge to the light fittings, add a modern edge to the room, while the paler tone used to line the floor lightens the space alongside the kitchen's white walls and ceiling. The kitchen and dining areas are not the only rooms in this lovely home designed to accommodate entertaining, with this bar area and casual dining setting also included to host a casual dinner or cocktail party. This space has been decorated with deep, brown tones reminiscent of those seen in the kitchen, although with a more playful appeal due to elements such as the mosaic finish of the bar and patterned upholstery of the dining bench. 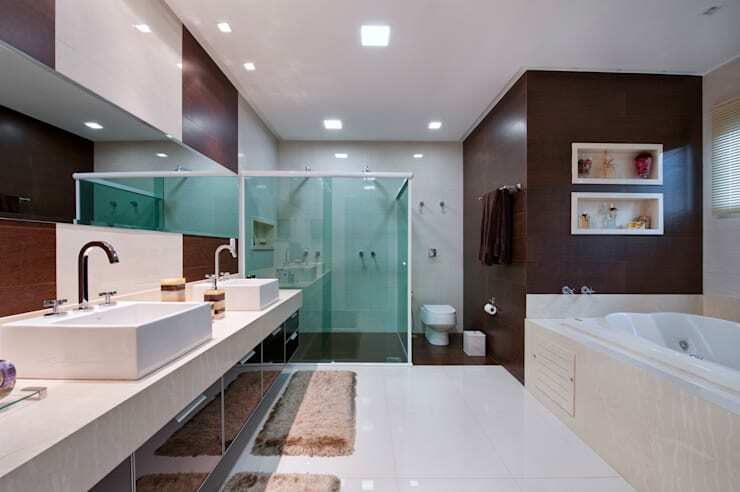 The bathroom rests in pristine splendour, with crisp lines and sleek finishes found throughout its range of construction materials. Twin sinks, a large spa and an expansive shower unit denote the room's generous dimensions, while the depth of dark wood and sheen of stone and porcelain infuse the space with a luxurious air. Peering inside one of the home's bedrooms and we're met with another striking, modern design, with this space dressed in a range of blue tones, and clearly destined to house a child or teenager. 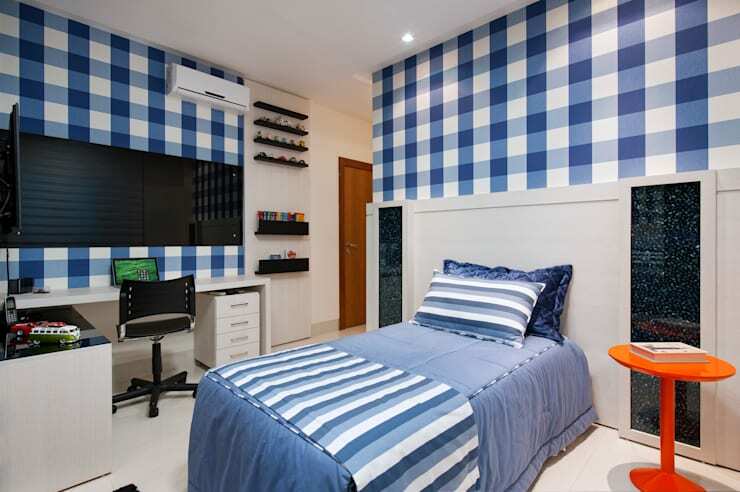 Blue, gingham wallpaper is complemented by bed linen in a similar pattern and style, while the sheen of contemporary, black finishes in and around the room's desk endow the space with a cool, modern edge. Plenty of space has been included for storage and display in the desk and surrounding shelves, while a striking, orange bedside table is poised in the corner for a dramatic colour contrast. For another glimpse at a stylishly decorated, modern home, take a tour of A Natural Hideout in the Middle of Nature! What do you think of this home's geometric facade and garden? Are you a fan of the interior colour scheme? Tell us below!